Harold William Holland, known as Harry, was born at Bower Hinton, Martock, in 1895, the son of blacksmith Frederick William Holland (1873-1940, known as Fred) and Harriett née Bailey (1874-1953). Fred worked at Sparrows in Bower Hinton, making agricultural implements. Frederick and Harriett were to have five children; Dorothy (1893-1975), Harry William (1896-1917), Leslie George (1905-1995), Stanley Fred (1907-1972) and Winifred L (1910-2006). In the 1901 census Frederick and Harriett were living at Harriett's father's house in Bower Hinton with Dorothy and Harry. By the time of the 1911 census the family had moved to Yeovil and were living at 2 Wyndham Street. Frederick was employed as an Engineering Smith's Foreman and 15-year old Harry gave his occupation as an Engineer's Clerk; both were working at James Petter's Nautilus Works on Reckleford. The family later moved to Dampier Street and, later still, to 30 Reckleford. 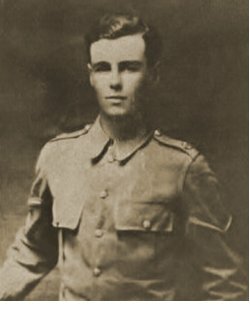 It is not known when Harry joined up but he enlisted in the Territorial Army at Yeovil and became a Private (Serial No 240441) in the 1st/5th Battalion of the Somerset Light Infantry - a Territorial Battalion formed on 4 August 1914 at the County Territorial Hall, Taunton as part of the South-Western Brigade, Wessex Division. He was named on a list of Yeovil recruits published in the local press on 1 December 1914. Harry was initially stationed at Plymouth for a few days and then proceeded to Salisbury Plain. The list of 1 December 1914 mentioned above, noted that Harry was on 'foreign service' by this date. Harry joined up with his cousin Joe Vivian and their friend Jim Larcombe (see fourth photo in the gallery) - these three were nicknamed the 'Three Musketeers' and served together in the Regiment. On 9 October 1914 the Battalion sailed from Southampton and arrived at Bombay, India, on 9 November 1914. The Battalion remained at Jubbulpore until December, when it proceeded to Ambala. Strenuous training began almost immediately and continued almost for the next year. In May 1916 a large draft of nine officers and 449 other ranks arrived from England. The battalion was temporarily divided during the ensuing hot weather with some companies going to Chakrata and the remainder to Meerut. The following months were mainly occupied in training the draft but even in the hills little was done beyond this owing to the exceptionally wet season. The Battalion was reunited in October at Meerut. On 26 April 1917 17 officers and 838 other ranks of the Battalion sailed on HMT Chakdara from Bombay, landing at Suez, Egypt, on 11 May 1917, becoming part of 233rd Brigade, 75th Division - part of the Egyptian Expeditionary Force in Palestine. Harry sent his mother a small souvenir book of pressed flowers from Palestine. Having spent an uneventful two and a half years in India it was now intended that the 1st/5th Battalion was to become involved in the attack on Gaza which had been ordered to take place on the morning of 2 November 1917 although 1st/5th Battalion of the Somerset Light Infantry were ultimately not employed in the attack. The Regimental History of the Somerset Light Infantry records "Several weeks training at El Arish and Rafa, where long route marches through the burning desert fitted the battalion for the part it was to play in the near future, followed on 28 August Nos 1 and 2 Companies of the Battalion went into the trenches in the Sheikh Abbas area, south of Gaza, and were attached to the Argyll & Sutherland Highlanders for preliminary instruction in trench warfare. "The health of the Battalion was not quite so good as previous month. Septic sores were very prevalent and 16 cases of dysentery occurred. The enemy's lines opposite Apex Right are nowhere near rather than 2,000 yards to our front-line trenches and the most important work done is by the night patrols. A considerable amount of work has been done on the trenches, 18 new dugouts have been constructed and additional trenches are being dug in our right subsector." Following the attack on Gaza, the 1st/5th Battalion were next engaged in the Battle of Nebi Samwil, part of the Jerusalem Operations, from 17 to 24 November 1917. General Allenby had decided to attack the Turkish Seventh Army and occupied Jerusalem. This necessitated an advance through the difficult country of Judaea and Allenby's plan of attack was to move through the Judaean hills and break out onto the main Jerusalem-Nablus road, cutting off the Turks in Jerusalem. On 14 November the three brigades of the 75th Division were deployed, with the 1st/5th Somersets occupying the ridges west of El Kesman. They moved on 16 November to take up a line on a range of low, stony hills to the east of Junction Station and remained in this position throughout the 17th, when the operations began. The infantry advance began on 19 November with the 1st/5th Somersets concentrating on the Jerusalem Road, north of Junction station and then proceeding forward. The attack on Enab was carried out by the 1st/5th Somersets in front. According to the Regimental History "There was heavy driving rain as the troops moved forward and mist covered the battlefield, but with great dash the attacking waves advanced and completely drove the Turks from their positions in front of Enab. For two hours during the early morning of 21 November the village of Enab was shelled heavily by the Turks and, owing to the congested state of the village -packed with troops and animals - casualties were heavy. The Battalion, which had gone into action on the 22nd November about 450 strong, had suffered 221 casualties in the two day's fighting - 3 officers killed and 6 wounded, 51 other ranks killed or missing and 161 wounded. Sadly, Harry Holland was one of those killed in action on 22 November 1917. He was aged just 22. Other Yeovil men killed in this battle were Frederick Wickstead, Fred Barnes, Wilfred Purchase, Thomas Luxton and Edward Bell. On 14 December 1917 the Western Gazette reported "Mrs Holland of Dampier Street, has received official notification that her son Private Harry Holland of the Somerset Territorials in Palestine, has been killed in action. Private Holland before joining up was employed in the office of Messrs. Petters’ Nautilus Works. Private Holland went to India with the Territorials in 1914, and was later transferred to Palestine." 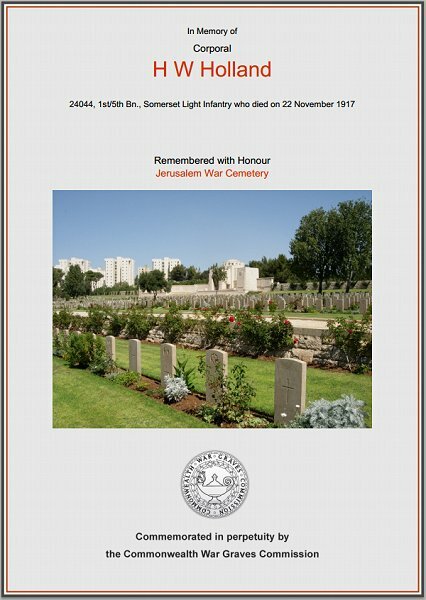 Harry Holland was interred in Jerusalem War Cemetery, Grave X.21, and his name is recorded on the War Memorial in the Borough. Many thanks to Gillian Fifield, and other members of Harry's family, for supplying extra family information and allowing me to use their family photographs on this page. 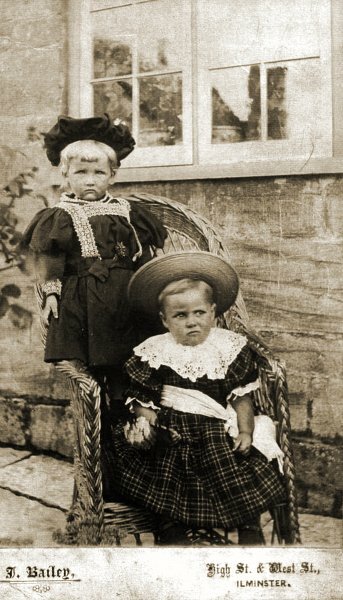 Harry Holland (seated in tartan dress) photographed with his sister Dorothy, c1897. They had, apparently, both just had a smack for misbehaving hence their expression in the photo. 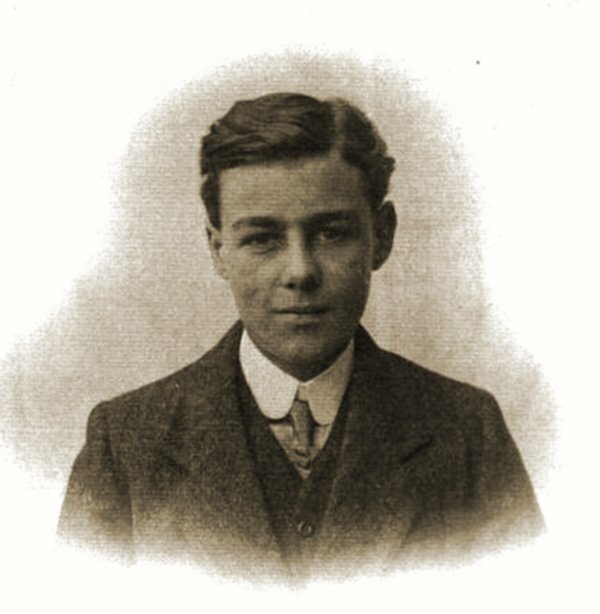 An early studio portrait of Harry, probably taken in Yeovil before he joined the army. 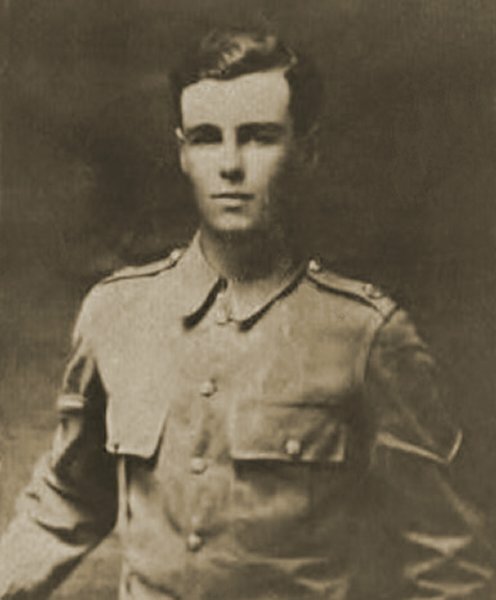 Lance Corporal Harry William Holland. He would later be promoted to Corporal. 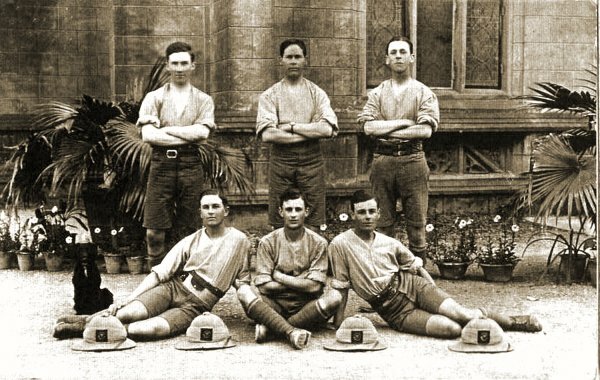 Harry Holland (front right) with other members of the 1st/5th Battalion of the Somerset Light Infantry in either India or Palestine. At front left is Harry's cousin Jo Vivian (Jo and Harry's mothers were sisters) and front centre is their friend Jim Larcombe. The Commonwealth War Graves Commission certificate in memory of Harry Holland.